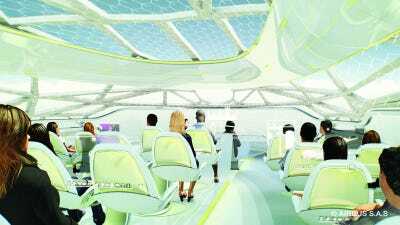 Airbus/EspacenetPassengers would sit in a 360 degree cabin. 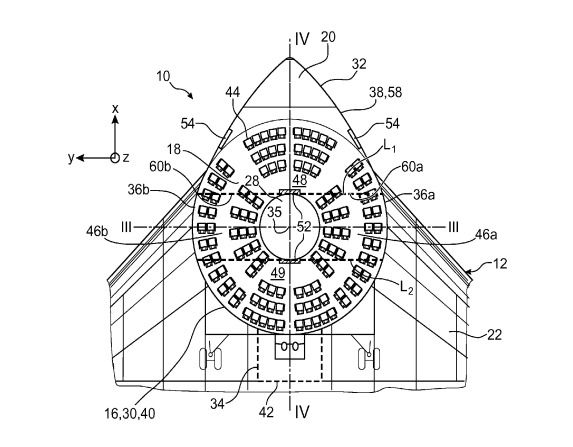 The image at right is not a UFO or a prop design idea from the new Star Wars movie — it’s a patent for a new commercial aircraft. The patent application from France-based Airbus SAS, an aircraft manufacturing division of the Airbus Group, was published last month, according to The Financial Times. It shows an elaborate design with a circular passenger cabin, tucked behind the plane’s nose and between its wings. 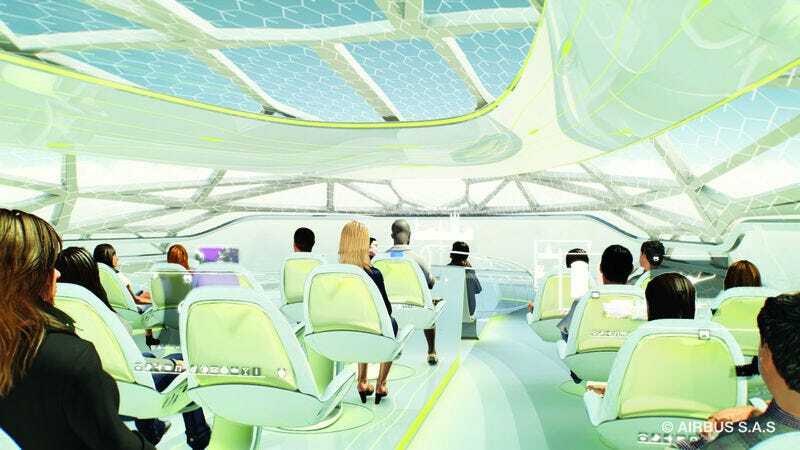 It’s been drawn up by listed inventors Patrick Lieven, Romain Delahaye, and Catalin Perju, who propose an aircraft with a cabin that “extends over 360 degrees around a space defined outside structure”. The shape tackles a problem in the airline industry. Cylindrical shapes are better at dealing with pressurised cabins, but at the front and back of these structures there needs to be strong reinforcements to counter stresses, the FT writes. The circle alleviates this issue. “The purpose of the invention is particularly to provide a simple, economic and efficient solution to these problems,” the application says. Airbus says it invests around €2 billion every year in its research and development, and submits more than 500 patent applications every year. 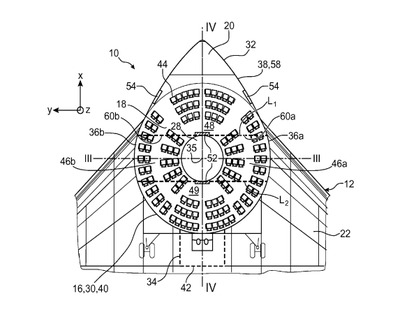 Although its patented the UFO-like design this year, it probably won’t be put into motion anytime soon. 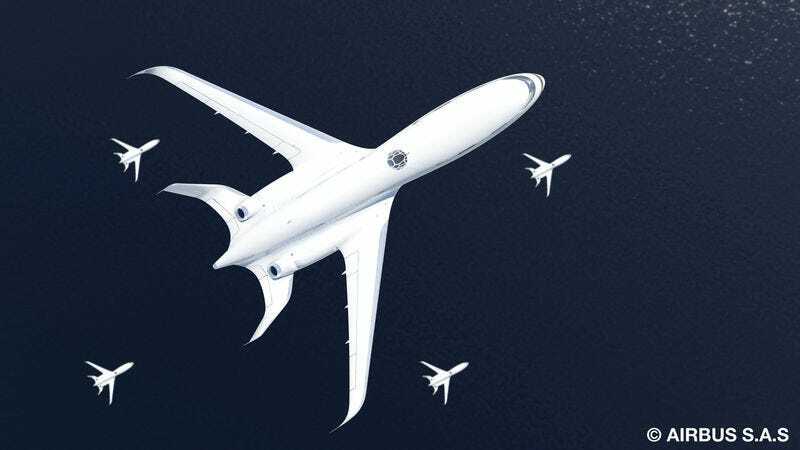 The company wants to improve flight times, reduce aircraft emissions, and better preserve energy sources. It says gliding capabilities, 3D printing, and even holographic technology could all one day be used in its planes. In 2012, Airbus even announced intentions to one day fly commercial jets “in formation”, like a flock of birds. It means “intelligent aircraft” would be able to organise, select the most efficient routes, and even rendezvous mid-air to reduce drag.